More than 150 participants met at DESY for the first LEAPS plenary meeting. The LEAPS members have organised themselves into several working and strategy groups dealing with new technological and scientific developments or with academic and industrial services and public relations. In addition, the LEAPS consortium also aims to contribute to solving major scientific and societal challenges in the fields of health, energy, food security, engineering and manufacturing, cultural and basic research that can be addressed through research light sources. In the plenary meeting, 13 pilot research projects were presented by the spokespersons of the different collaborations. Representatives of the national funding agencies and the European Commission discussed how the LEAPS programme could be supported in the future in the European research funding landscape. SESAME Council Chair Rolf Heuer (left) and LEAPS Chair Helmut Dosch signed the association agreement of LEAPS and SESAME. 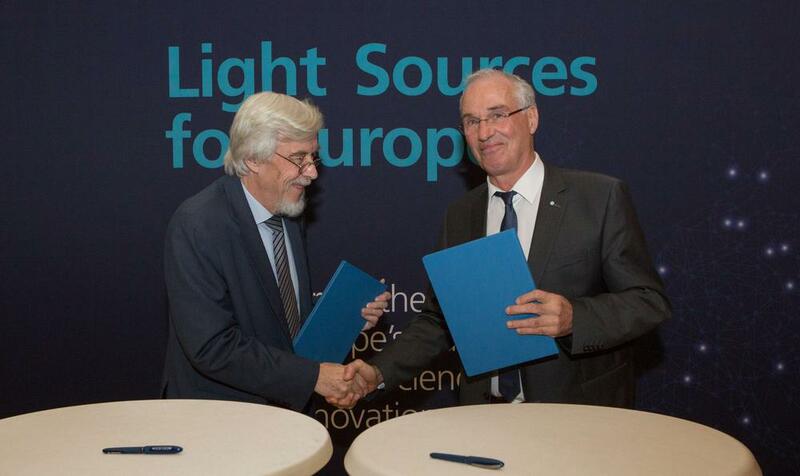 At the meeting, LEAPS also welcomed its first associated partner, the international lightsource SESAME in the Middle East: Rolf Heuer, Council Chairperson of SESAME, signed the association agreement with LEAPS.